EC readings can be used to determine the approximate TDS (‘total dissolved salts’) of various aqueous solutions. However, growers must be aware of the dangers of dosing on the basis of TDS rather than EC. ● Soft 'natural' waters^: Multiply the conductivity by the factor listed in the second column of Table 18.40. The factor depends on the conductivity units specified on the meter. Hence if a 'natural' water sample has an EC of 2.0mS/cm, it can be estimated that the TDS is 1,100ppm (2.0mS/cm x 550). ^ e.g. Uncontaminated scheme water, bore water, swamp water. ● Hard/ alkaline waters: These waters require a conductivity factor of around 650 when measured in mS/cm. ● Inorganic nutrients: The typical grow and bloom hydroponic nutrient formulations have much higher concentrations of heavier ions like potassium and phosphate. Consequently, these solutions require a higher factor than the 'waters' mentioned above i.e. ~800 when measured in mS/cm. To further illustrate how important it is to consider the type of solution being tested, many high phosphate “PK” flowering additives will require a conductivity factor of ~1,100 (when measured in mS/cm). 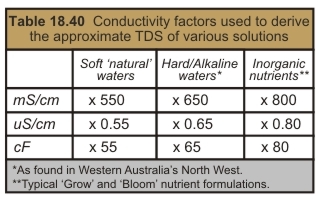 It is not uncommon to find some hydroponic operators assigning a TDS value of about 1,400ppm to the common 2.76 mS/cm conductivity standard i.e. they have used a conversion factor of 500. This factor is only valid for relatively pure sodium chloride waters. As discussed above, 800 is a more realistic factor for hydroponics - because many nutrient mixtures of around 2,200 ppm (true) yield a conductivity of 2.76 mS/cm. Additionally, quoting TDS values derived from conductivity readings, and without quoting the factor used, can imply different conductivity values to different people i.e. depending on what conversion factor they use! Consider the following scenario: You calibrate your TDS meter with a 2.76mS/cm Conductivity Standard to 1,800ppm. Using the same Conductivity Standard, your friend calibrates his meter to 1,400ppm. If you then give your friend a nutrient strength recommendation in TDS, he will add 30% more nutrient than what you intended! In summary: Conductivity factors which attempt to accurately convert conductivity readings into TDS must be customized to suit both the concentration range and ratios of the particular salts present in the water being analyzed. This requires prior knowledge of the sample's composition and, logically, such an effort would be counterproductive. Thus the inevitable conclusion is that the general use of conductivity to determine TDS is, at best, only an approximate method. Remember, the fundamental property being measured is conductivity. TDS is a derived value and employs guesswork regarding the composition of the solution. For these reasons, in the water industry it is fast becoming international practice to simply quote electrical conductivity (EC) values and not TDS.